Daphne is married to Leo and they have two children, Ruben and Romina. She is the editor of the Spanish World Wide Web Circle of Friends Website and the Spanish newsletter. She also maintains a wonderful site called Motherhood, What a Glorious Career. Daphne collects ribbons, laces, craft items, nature items, mini-musical instruments, craft magazines, stones, pins and badges from places she visits. Her hobbies and interests include crafts, sewing, gardeing, the computer and reading. Daphne has published a book called Daphne's Little Black Book . Within its pages (in both English and Spanish) you will find cures for stains, homemade deodorants, secrets of lemons, sixty uses for salt, uses for coffee, herbal remedies, how to get rid of mosquitos, beauty tips, flowers and their meanings, gems and their meanings and astrological chart and so much more. Daphne was born and raised in England. She moved to Argentina on marriage, learned Spanish and became bilingual and took training as a teacher of English. She does translations to and from either language. ?A ball is a circle. No beginning, no end. Today I pass the friendship ball to you. Pass it on to someone who is a friend to you.? Join us in our chat room. Copyright 2000-2004 ? 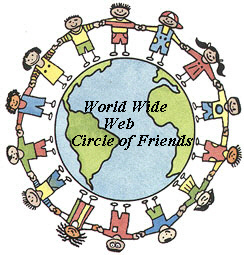 Worldwide Circle of Friends. All rights reserved.